Is Your Passover Seder a Museum? This post was originally published in the BIJ Bulletin, March/April 2011. There are many emotions that come to us during the Pesach holiday and especially during the Seder meal. The Seder along with the Haggadah comprise an exceptional educational tool, bringing stories, teachings, rituals, symbols, food, song, smells and even argumentation, to teach us about the Exodus story. This educational process seeks to open our heads and our hearts: the former to learn and understand the details of the Exodus story and the Pesach customs, and the latter to imagine that we were slaves and to feel the emotion on becoming free. We recently witnessed that joy reflected in the faces of Egyptians in Tahrir Square. Of course, we don’t just recall the Exodus at the Seder. The meal brings to mind dear family and friends who sat beside us in past years, some of whom are no longer with us. We can almost hear their voices reading from the Haggadah or calling out from the kitchen whether we want one matzah ball or two with our soup. These family memories have a serious emotional weight and can make it difficult to make any changes to the Seder, from the text that is read to the food that is served. Changes can be seen as a disrespect to our elders as well as creating a break with a beloved tradition. I bet that every one of us can find something about their family’s Seder that they consider an essential tradition. But really, there are some changes that should be made, starting with the Haggadah. This is the essential tool for our exploration of the holiday, and yet many people still use a very old edition. Is the Haggadah that you’re using really appropriate for your family and guests? Are you still using the stack of free Maxwell House copies that may have changed the art work during the past decades but not the old-fashioned English text (I mean, “condescendeth?”), nor updated its sparse Ashkenazic transliterations? Transliteration. Every prayer or part of the text should be transliterated so that everyone can follow along with the Hebrew should they wish to. Translation. The translation should be in modern English. Usage. The English should attempt to be gender neutral whenever possible. Context. The Haggadah should have extra materials that explain the story or expand on it for a modern participant. 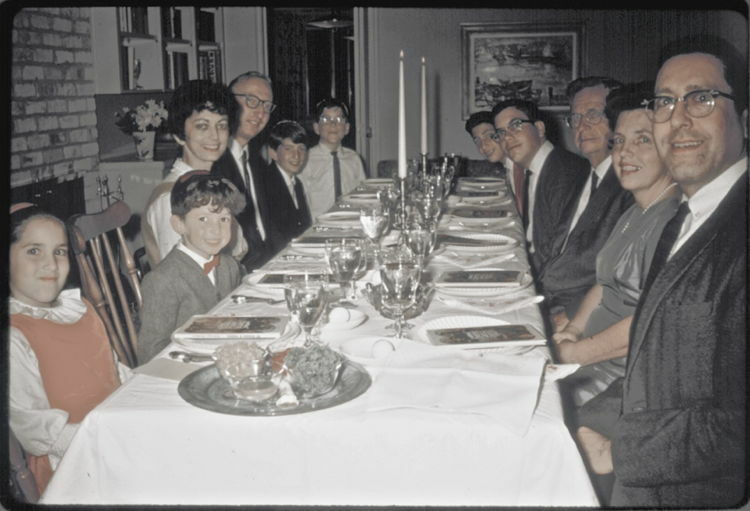 Take a look at the photo of my family gathered around the table in 1966 for our Seder along with the Schwartz family. I’m leaning forward in the middle of table, and my sister Ann is on the left. You can see the Haggadah we were using then, which we used for decades. It was published in 1955 by the Shulsinger Brothers Linotyping and Publishing Co. It presents a “faithful English rendering,” which of course means lots of “thy” and “thee.” But we can become fond of this archaic language. My sister can recite by memory its poetic version of Nirtzach (Conclusion) including, “Pure One, Dweller in height august, raise up the folk of countless dust!” Oy! Some time in the 1980s, we embarked on a search for a new Haggadah, using some home-grown versions, and published editions. One had cartoons as illustrations and spiritual exercises to perform. Finally, we settled on the 1989 On Wings of Freedom: The Hillel Haggadah for the Nights of Passover, edited by Rabbi R. Levy. All of the texts are translated with egalitarian language and transliterated. And it includes many readings on a variety of spiritual and Jewish topics, some now outdated such as the plight of Soviet Jewry. I usually bring in my own readings from my collection of Haggadot or from other sources. I will leave a copy of it in my mailbox in the office if you want to check it out. However, there are many fine new editions of the Haggadah available now that can fulfill the above criteria and without great expense. A trip to Jewish stores in the area will let you evaluate them as well as pick up some Pesach tchotchkes. Our yearly Seder should not be an emotional museum, rather a living, creative moment that brings our spiritual values and traditions to each generation, l’dor vador. Kavvanotes is a bilingual pun: "Kavvanot" are the intentions behind our prayers, and "notes," well, you get it. This blog is authored by David Morgenstern, cantorial soloist living in San Francisco and a blogger on technology at ZDNet.com. Its subjects include: life and living, Judaism, a spiritual search, the work of a cantorial soloist, and the intersection of technology and religion.